M. Wang. Doctoral thesis. 2012. Autorenbeitrag in "Perspektiven für Informatiker 2018", e-fellows.net wissen, p. 172 ff. M. Schnürmacher, D. Göhring, M. Wang, T. Ganjineh. High Level Sensor Data Fusion of Radar and Lidar for Car-Following on Highways. In: Journal of Recent Advances in Robotics and Automation, Studies in Computational Intelligence, Springer-Verlag, Vol. 480, pp. 217-230, 2013. Y. Fu, H. Moballegh, R. Rojas, L. Jin, M. Wang. A Realistic Simulator for Humanoid Soccer Robot using Particle Filter. In: Journal of Recent Advances in Robotics and Automation, Studies in Computational Intelligence, Springer-Verlag, Vol. 480, pp. 275-288, 2013. D. Göhring, D. Latotzky, M. Wang, R. Rojas. Semi-Autonomous Car Control Using Brain Computer Interfaces. In: Advances in Intelligent Systems and Computing, Vol. 194, Part 1, pp. 393-408, 2013. M. Wang. 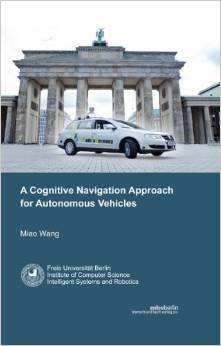 A Cognitive Navigation Approach for Autonomous Vehicles. Doctoral thesis, supervised by Prof. Dr. Raúl Rojas, reviewed by Prof. Dr. Raúl Rojas and Prof. Dr. Wünsche. Submitted May 2012, Defended Nov 2012). Institute of Computer Science, Freie Universität Berlin, 2012. S. Wang, S. Heinrich, M. Wang, R. Rojas. Shader-based Sensor Simulation for Autonomous Car Testing. In: Proceedings of the 15th IEEE International Conference on Intelligent Transportation Systems (ITSC), pp. 224 - 229, 2012. M. Wang, T. Ganjineh, R. Rojas. Action Annotated Trajectory Generation for Autonomous Maneuvers on Structured Road Networks. In: Proceedings of the 5th IEEE International Conference on Automation, Robotics and Application (ICARA), pp. 67 - 72, 2011. P. Czerwionka, M. Wang, F. Wiesel. Optimized Route Network Graph as Map Reference for Autonomous Cars Operating on German Autobahn. In: Proceedings of the 5th IEEE International Conference on Automation, Robotics and Application (ICARA), pp. 78 - 83, 2011. D. Göhring, M. Wang, M. Schnürmacher, T. Ganjineh. Radar/Lidar Sensor Fusion for Car-Following on Highways. In: Proceedings of the 5th IEEE International Conference on Automation, Robotics and Application (ICARA), pp. 407 - 412, 2011. Y. Fu, H. Moballegh, R. Rojas, L. Jin, M. Wang. Reality Sim: A Realistic Environment for Robot Simulation Platform of Humanoid Robots. In: Proceedings of the 5th IEEE International Conference on Automation, Robotics and Application (ICARA), pp. 283 - 287, 2011. A. Reuschenbach, M. Wang, T. Ganjineh, D. Göhring. iDriver - Human Machine Interface for Autonomous Cars. In: Proceedings of the 8th IEEE International Conference on Information Technology: New Generations (ITNG), pp. 435 - 440, 2011. M. Wang, D. Latotzky. Driving an Autonomous Car with Eye Tracking. Technical Report, B-10-03, March 2010. M. Wang. Remote Controlling an Autonomous Car with an iPhone. Technical Report, B-10-02, March 2010. R. Guilbourd, B. Hecht, A. Manecke, F. Ruff, M. Wang, N. Yogev, R. Rojas, P. Vidales. InformA (Information Appliance) – Ein Informationsgerät für Blinde und Sehbehinderte. In: Proceedings of the Conference on Elektronische Sprachsignalverarbeitung (ESSV), 2009. M. Wang. M. Bader, M. Block, R. Rojas. Intelligent Agent-Based Board Games for Multi-Touch Systems. 4th Microsoft Academic Days (AD), 2008. M. Wang. Intelligent Agent-Based Game Systems in Multi-Touch Environments. Diploma Thesis. 2008. M. Wang. Intelligente agentenbasierte Spielsysteme für intuitive Multi-Touch-Umgebungen. Diploma Thesis. 2008. M. Wang, J.-P. Follenius, M. Bellem, O. Röwer. SMART. Extreme Blue Internship report. IBM Boeblingen. 2007. M. Wang, J.-P. Follenius, M. Bellem, O. Röwer, S. Hees, V. Hoose, A. Bieswanger. New approaches to stabilize transformation matrices for pose estimation. DE820070235 patent disclosure. IBM Boeblingen. 2007. M. Wang, J.-P. Follenius, M. Bellem, O. Röwer, S. Hees, V. Hoose, A. Bieswanger. Dynamic Layout Management in Augmented Reality Scenarios. DE820070218 patent disclosure. IBM Boeblingen. 2007. M. Wang, F. Thiel, R. Richter, M. Schulze. Falling Cubes. Seminar paper, Freie Universität Berlin. 2007. M. Wang. Scheduling On-Demand Broadcast Items. Seminar paper, Freie Universität Berlin. 2007. M. Wang. Pair Programming. Seminar paper, Freie Universität Berlin. 2007. M. Wang. Reality Sim: A Realistic Environment for Robot Simulation Platform of Humanoid Robots. IEEE 5th International Conference on Automation, Robotics and Application (ICARA), 2011. M. Wang. iDriver - Human Machine Interface for Autonomous Cars. IEEE 8th International Conference on Information Technology: New Generations (ITNG), 2011. F. Ruff, R. Guilbourd, S. Hecht, M. Wang, N. Yogev. InformA - Akustische Informationsreproduktion. T-Com Laboratories 2009. M. Wang. Intelligente agentenbasierte Spielsysteme für intuitive Multi-Touch-Umgebungen. Diploma Presentation. M. Wang, M. Bader, M. Block, R. Rojas. Intuitive Spielsysteme für Multi-Touch-Umgebungen. 4th Microsoft Academic Days (AD), 2008. M. Wang. Intuitive Spielsysteme für Multi-Touch-Umgebungen. AI-Game Programming Group. M. Wang. Windows Presentation Foundation. Microsoft Roadshow CampusLaunch 2008. M. Wang. Neues in Visual Studio 2008. Microsoft Roadshow CampusLaunch 2008. M. Wang, N. Zoar, M. Blersch, J. Fähndrich, S. Richter. C# Programmierkurs. Microsoft Workshop Week. M. Wang, F. Thiel, R. Richter, M. Schulze. Falling Cubes. Freie Universität Berlin. C. Sokol, B. Mikolajczyk, M. Wang. Umfrage zum Support in Open Source Projekten. Empirische Bewertung in der Informatik. M. Wang. Scheduling On-Demand Broadcast Items. Freie Universität Berlin. M. Wang, et al. Hearst Evaluator Final Milestone. Web Technologies Project. M. Wang. Dynamic Scheduling with Microsoft Office Project 2003. Projektmanagement mit MS Project. M. Wang. Do Killergames kill people?. English for Scientists. M. Wang. Pair Programming. Freie Universität Berlin. M. Wang, et al. TALK Project. Software Engineering Project. 2011/08/29, Discovery Channel, Discovery Channel: Daily Planet Video "Road Warriors"
2010/04/21, automotiveIT, Allein die Augen steuern "Spirit of Berlin"
2009/10/28, Berliner Morgenpost, Der Traum vom iPhone-Auto, p. 13. 2009/10/23, Spiegel TV Online, Autofernsteuerung per iPhone: James Bond lässt grüßen. 2009/10/23, Welt TV Online, iPhone lenkt Auto. M. Bellem, J.-P. Follenius, O. Röwer, M. Wang. SMART. Documentation. IBM Boeblingen. 2007. M. Wang, et al. Hearst Evaluator. Developer and User manual, Freie Universität Berlin. 2007. M. Wang, et al. Hearst Evaluator. User manual, Freie Universität Berlin. 2007. A. Waldmann, B. Mikolajczyk, M. Wang. TutHelp Documentation. Project Documentation, Freie Universität Berlin. 2006.